I’ve read so many articles and blogs and books about traveling. The common theme in these stories is excitement. The stories often have a dramatic edge. In the spirit of excitement, there is often reckless abandonment of caution and unplanned success. The stories are invigorating and inspiring – always with a happy ending. As my bike stares back at me, daring me … I find myself thinking that I’ve never read the version of the story that started with a daunting case of nerves. This seems to be my story. The inspiration for this summer’s adventure began a few lifetimes ago. When I was young, my family used to camp. I remember watching bicyclists loaded with camping gear trekking along California blue roads from the window of our VW Camper. I loved to ride my bike. And I was instantly in love with the idea of being self-sufficient on two-wheels trekking anywhere I wanted to go. Anyone who has known me over the past few decades could testify that I am an adventurous person. I have been known to get up and go do something based on very little information, sometimes on just an idea that something would be fun. I have had many happy endings to those stories, just like those I have read. So why worry now? I stare at my bike. Its panniers and fork bags puffy with camping gear. As if in answer to my question, the front fork bag of my bike falls off and spills. It’s the logistics of this trip that make it like no other. I’ve always been able to fill a backpack or a suitcase and go. But this summer, the adventure includes more than what can be packed in a backpack. We’ve planned a trip that involves bicycling around a foreign country for three months. The activities on the trip are to include sightseeing, culinary adventures, fishing, photography, backpacking and maybe even pack rafting. Aside from test packing and other activities we can do to get ready while in Alaska, the additional logistics are mind boggling. In order to get this trip started, there is the first leg – which seems to be the most daunting of the logistics – we need to maneuver all of our gear from our tiny village of Chignik Lake, through the city of Anchorage and all the way to the north island of Hokkaido, Japan. The other part of the logistics is planning for daily mileage and making sure we are in good enough shape to pull off this physical adventure. All this planning is, of course, in theory. I have so many questions… How many miles can we realistically bike? Can we carry all the gear we want to carry? Are we over packing? Are we forgetting something critical? Will our gear be safe from thieves? Will we be able to find campgrounds as easily as we hope? Will the roads be safe to ride on? Are we going to have trouble transporting our gear with the airlines? Is this too big an undertaking? So, Jack and I sat down to tackle, not the questions, but the psychology behind the questions. Our discussion centered around the question, “Do we really want to take on a trip so far outside of our comfort zone?” The answer, it turned out, was a resounding Yes! So, plane tickets have been purchased. The first test packing has been completed. Our trip itinerary is coming together. The bike and treadmill workouts are underway. And the faith that we are resourceful people is the response to those questions that really can’t be answered until we begin the journey. And now I propose a toast: Here’s to another summer of epic proportions living well off the beaten path. Cheers! And Then Gillie was Gone… Or… Intrepid C-Dory Thwarts Thieves! Gillie faithfully following her crew, enjoying the canola fields of Alberta. July 18, 2016, Yukon Territory. In an incredible act of heroism, the fishing vessel Gillie, a 22’ C-Dory Angler freed herself from an attempted abduction. Following her captains north to Alaska on the Alaska-Canada highway, Gillie, along with Stanley the Chevy Silverado and Lance the Cab-Over Camper, had pulled off the highway for a driving break at the Smart Creek turn-out near the British Columbia/Yukon Territory border. Her captains were gone for mere minutes, looking for grayling and char in the trouty-looking river just out of Gillie’s view when the thugs attacked. Armed with precisely the right tools, the perpetrators made short work of Gillie’s couplings, hitched her to their own criminal vehicle, and sped off. At this point, Gillie feared the worst. She imagined herself in a chop shop, her engines torn from her stern, her insides gutted. She shuddered, knowing she may never see her beloved captains again. But when she shuddered, she noticed that in their haste, the thieves had neglected to properly secure the nut holding the hitching ball in place. Each time the speeding trailer hit a bump on the very bumpy Al-Can, Gillie put her own two tons of weight into the bounce. Bit by bit, the nut worked its way down the hitching ball shank. “If I can just get free before they hit the chop shop…” She didn’t complete her thought. Not more than 50 meters up the road was a bright orange marker. She knew what that meant. Big Bump. “This is it,” she thought, digging deep for the courage she’d need to withstand the crushing impact when the tongue of her trailer hit the pavement at 70 miles (110 kilometers) per hour. The front wheels of the thieves’ truck hit the bump, Gillie gave herself a mighty lift, the trailer wheels careened over the bump, Gillie slammed down hard on the hitching ball and, to her great joy, rebounded, catching just enough air to lift herself clear. The tongue of the trailer came down with a heavy, metallic, grating crash! The safety chains holding the trailer to the truck went tight. Now, atop the trailer, still upright, Gillie was being dragged along while the tongue of the trailer cut a scar into the highway asphalt. From the cab of the truck, Gillie could hear loud shouting and words that can’t be printed here. The next thing she knew, the truck was pulling off the highway. “Yea!” Gillie exclaimed in thought. But the shoulder was steeply canted. “If they go any further, I’m going to roll!” She thought in a panic. Just in the nick of time, the whole rig skidded to a halt. The thieves burst out of their truck, cursing their “bad luck” and accusing each other. They had little choice and they knew it. Already, police between Watson Lake and Teslin were looking for the most unmistakable boat on the Al-Can. Gillie didn’t know it, but her captains had already supplied the Royal Canadian Mounted Police (who always get their boat) with a photo of Gillie and a description of a possible suspect vehicle. Gillie didn’t know this, but thanks to their friends who listened to police scanners, the thieves did know it. With a hot boat atop a disabled trailer and police on the lookout, the thieves had no choice but to cut and run. Her captains were in the midst of a rather quiet, pensive dinner at the Yukon Motel and Restaurant in Teslin when Officer Stelter of the Royal Canadian Mounted Police entered the establishment and confidently strode toward their table, barely able to suppress a grin. The restaurant hostess quickly packed the dinner “to go.” The captains climbed into the Chevy, fueled up and hustled to the site, 42 miles to the east. By the time they arrived, Officer Stelter had already secured a brand new 2” hitching ball to the trailer – held fast in place with a properly tightened nut. You never saw a bigger smile on a boat. Her captains were smiling pretty hard, too. 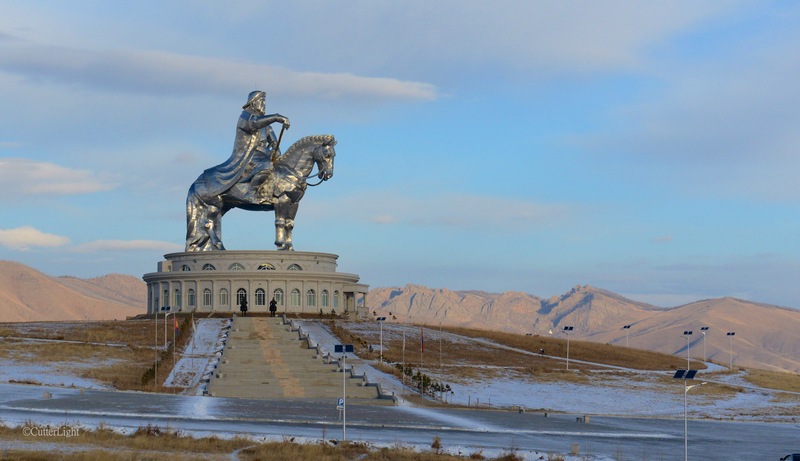 There is no overstating the importance of Chinggis Khan – ruler of all who live in felt tents – to the Mongolian people. 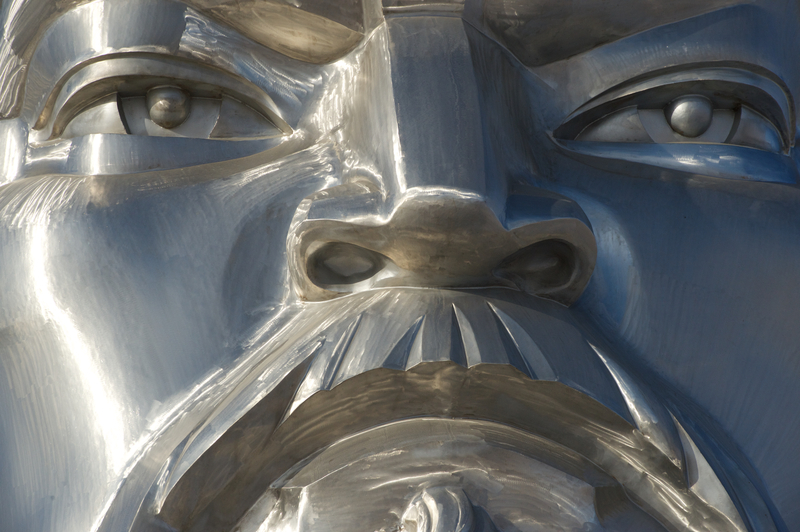 Revered in film and in statues such as this 40 meter (131 feet) tall monument , the founder of the Mongolian Empire is evoked in everything from currency to Ulaanbaatar’s international airport to vodka labels. Sitting at an altitude of 4,429 feet above sea level, just over one million people live in Ulaanbaatar, Mongolia’s capital city. Another 1.7 million Mongolians live in the countryside, either in smaller communities or as nomadic herders on the highland steppe or vegetated regions of the desert. In former times, these grasslands and the nomadic herding culture that accompanied them stretched through Kazakhstan as far west as Hungary, so when Chinggis Kahn proclaimed himself ruler of all who live in the circular, felt-covered tents called gers that were the homes of these nomadic people, he was laying claim to the largest contiguous land mass ever to fall under one empire. Looking east toward the place of his birth, Chinggis still dominates the rugged Mongolian steppe. 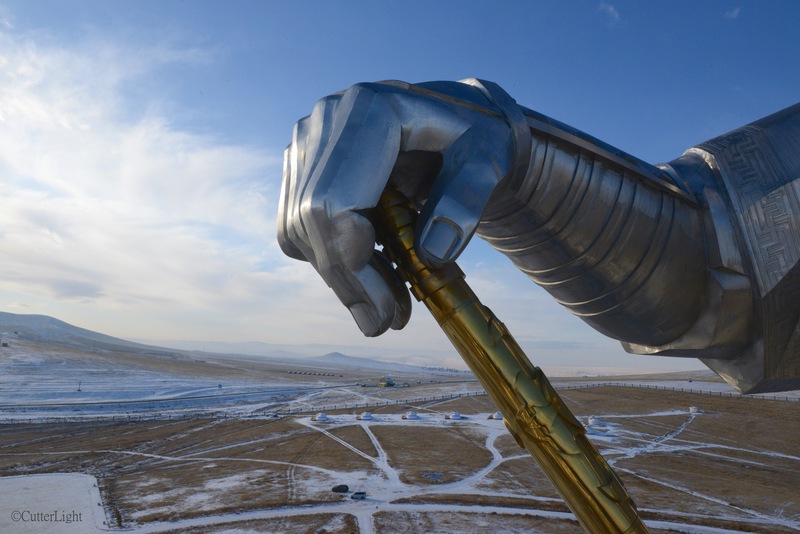 Two hundred-fifty tons of stainless steel went into this statue which is situated at the location where a young Temüjin (Chinggis’s boyhood name) found a golden whip and took it mean that he was destined to become a great leader. At his birth in 1162(? ), the land of Tumüjin’s childhood was occupied by numerous, often warring nomadic tribes. Part of Chinggis’s legacy includes uniting these tribes under one rule and in the process creating a national identity for the Mongolian people. The nomadic culture has died out or essentially been extirpated elsewhere such as in Kazakstan and Hungary. Under Stalin, the Soviets waged an unrelenting campaign to wipe out or drive out nomadic herdsmen, in many locales turning former grazing lands into collective farms and bringing about mass starvation in the process. But in Mongolia, a land sufficiently insulated and independent enough from both the Russians and the Chinese, hundreds of thousands of Mongolians still live much as they did in the 13th century when Chinggis rose to power. As such, they are the last truly nomadic people in the world. Millennia of equestrian know-how passed down generation to generation is still showcased in annual tournaments where horse-mounted riders traveling at full gallop demonstrate an ability to pierce man-sized targets with arrows shot from simple bows. It is easy to imagine the terror such skilled, mounted warriors would have invoked in territories where horsemanship was all but unknown. In addition to enemy soldiers felled in battle, under the various Khans, Mongolian armies slaughtered tens of millions of civilians in locales where people had refused invitations to surrender. At its zenith, the Mongolian Empire stretched from eastern Europe through much of China and Southeast Asia all the way to the shores of the Pacific Ocean. Present day Mongolia lies within the bean-shaped boundary partially covered by the map key. The positive aspects of Chinggis’s legacy include bringing political stability to the Silk Road and thus to regional commerce, establishing religious tolerance, fostering intellectual growth and greater communication throughout the empire, and quelling the region’s history of tribal and clan warfare by introducing meritocracy to government. 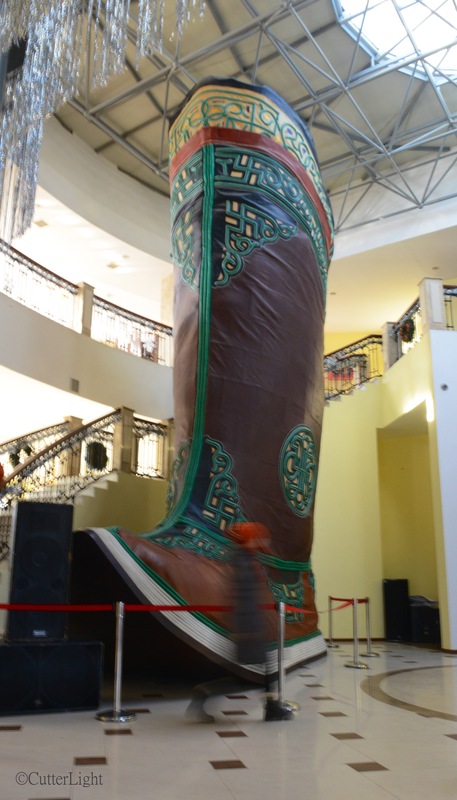 This leather boot, located in the museum below the statue, is the same size as the stainless steel boots on Chinggis’s feet. The statue was completed in 2008 and is currently the largest equestrian statue in the world. 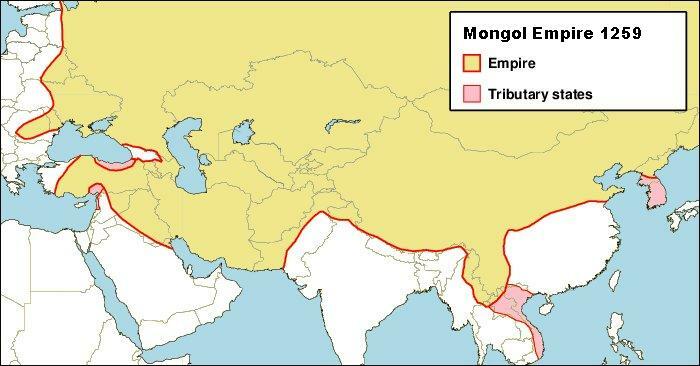 From the end of the 17th century until 1911, Mongolia was under the control of China. Soon after that, they fell under Russian hegemony and in 1924 were declared a satellite state of the Soviet Empire. It wasn’t until 1989 that Russia withdrew it’s troops from Mongolia. In 1992, Mongolia created a new constitution and a multi-party democracy. Mongolia is thus at once a very young country, and a very old one. A Lincolnesque statue of Chinggis Khan overlooks Ulaanbaatar’s central square from the steps of the Government Building. 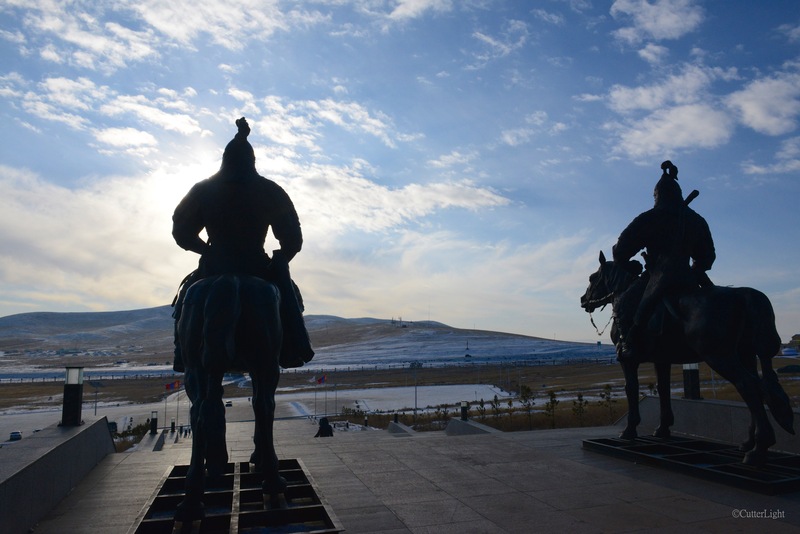 Change is happening quickly in this young democracy; just recently the capital city’s central square, Sükhbaatar Square, was officially renamed Chinggis Khan Square. 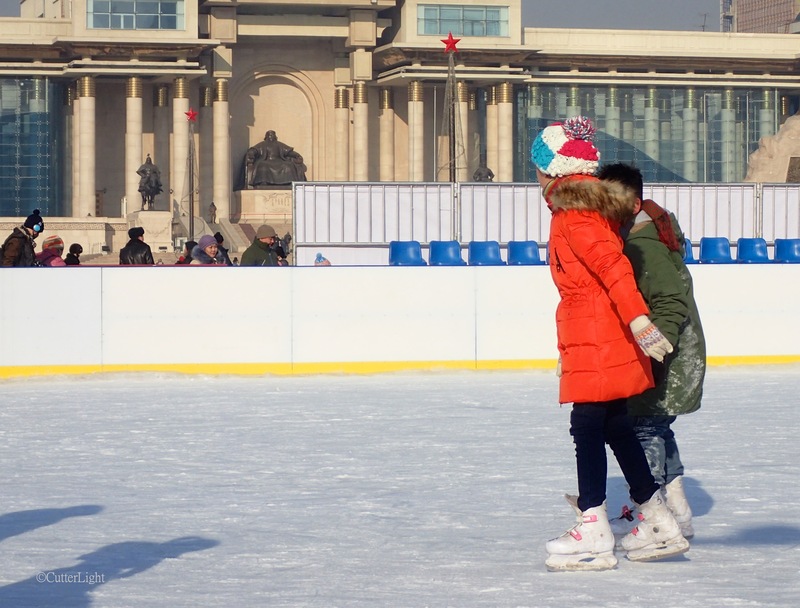 With an abundance of valuable natural resources (gold, copper, uranium and molybdenum among them) and a resilient, well-educated, optimistic populace, Mongolia’s future looks bright. 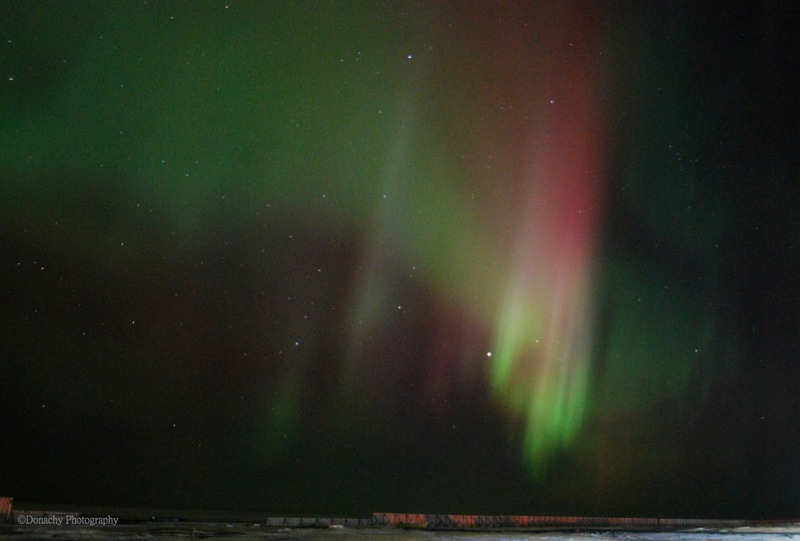 The northern lights have been out nearly every night lately. 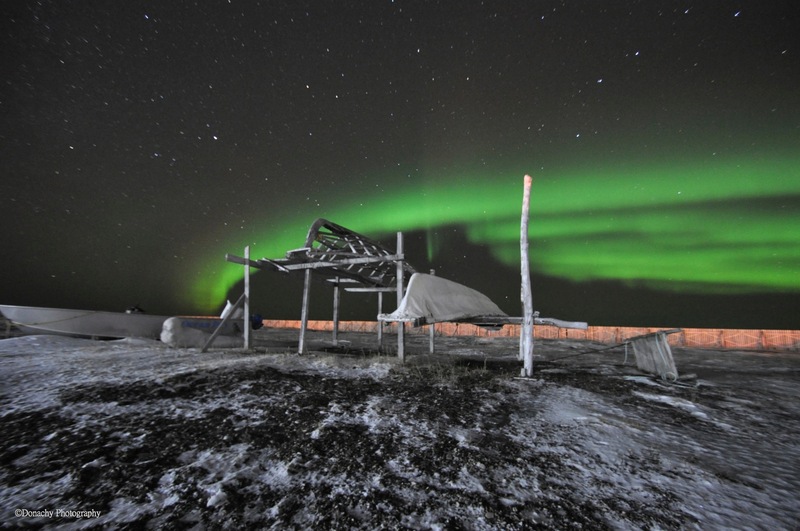 Here they frame two umiak – seal skin boats used for the spring whale hunts. Yanagiba (sushi knife), ohashi (chopsticks) properly resting on an ivory spotted seal hashioki, and David Gelb’s documentary of world-renowned sushi chef Jiro Ono. Let the feast begin. The shots of sushi will wow you. Segments depicting 85-year-old Jiro Ono magically transforming rice and fish into pieces of art that are at once too beautiful to be eaten and yet must be eaten will mesmerize you. The manner in which he and his 51-year-old son run Sukiayabashi Jiro, a 10-seat sushi restaurant in the underground subway system in Tokyo’s ritzy Ginza District will, perhaps, prompt you to make subtle (or not so subtle) changes in the way you run your own kitchen. At the very least, you are likely to come away from the film with a heightened appreciation of tamagoyaki – the grilled egg dish frequently served on nigiri sushi menus. Sukiabashi Jiro is the only sushi restaurant in the world to earn Michelin’s top rating – the coveted three stars. The simple definition of a three-star restaurant is this: a restaurant that by itself makes a trip to that country worthwhile. As a self-taught chef, as a father, as a person who is seeking to perfect my own path in life, and as one who lived in Japan for nine years and came to deeply appreciate the Japanese sensibility toward life, this film profoundly moved me. Jiro Ono embodies the characteristics of the shokunin – a master craftsman or artisan who, while possessing superb technical skills in his field, is also aware of his responsibility to model an honorable life and to look out for the welfare of others. In the film, Masahiro Yamamoto, one of Japan’s leading food critics, identifies the five attributes of a great chef. These attributes are no doubt valued by all shokunin. I’m going to add a sixth element to Yamamoto’s list. If Jiro’s life is about striving for perfection, the question is begged, “Perfection to what end?” To what purpose are the above five attributes? It is this: They are all aimed toward providing others with an ultimate experience. 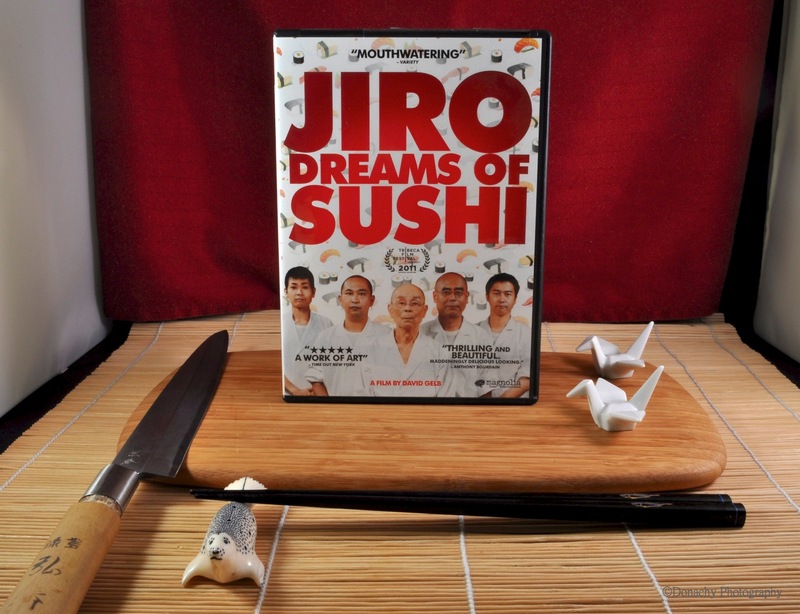 Jiro dreams of sushi, yes. But what he really dreams of is providing his customers with a perfect dining experience. That is the sixth attribute: The desire to provide others with a penultimate experience. Some of these attributes are, perhaps, antithetical to current western thinking. Therein lies the core of the criticisms of this film. Aren’t we supposed to value collaboration? Is the emphasis on cleanliness really so important? Is Jiro truly interested in others, or is he merely a shallow, self-inflated ego with no meaningful connection to other human beings – including his wife and his two sons? Doesn’t taking one’s work too seriously lead to imbalance in life? I think this much is fair to observe: The path Jiro Ono has chosen in life is not a path that would suit everyone. But it is a path I admire. In the director’s cut, it is mentioned that a regret is that Jiro’s wife was unable to be in the film. This seems to be owing to the health of a woman in her 80’s, not about a failed partnership. His sons are both key players in the film, and speak of their father with honor, respect and love. They have both chosen to follow in his line of work, to embrace his teaching and have become highly respected sushi chefs in their own right. In turn, Jiro speaks with pride and admiration of both of his sons. As a father, I can very much relate to Jiro’s philosophy regarding child-rearing. You spend your life teaching and guiding, and in the end you hope a good bit of it takes root. In both of Jiro’s sons, his teaching did stick, his guidance payed off, and because his sons worked for many years in his restaurant, he ultimately spent more time with them than most fathers ever spend with their children. As to taking one’s work too seriously and carving out one’s own path rather than collaborating, I grew up in a family wherein, not just in my nuclear family but in all the uncles and aunts in my extended family, the life philosophy most frequently espoused was an admonition to not take work (or anything else) too seriously. It was a philosophy that did not work for me, and ultimately inspired an opposing philosophy. At the age of 4o, I began the long, sometimes arduous, deeply satisfying process of remaking my life. Part of the remaking has been rooted in a newfound freedom – a self-given permission to pursue life with renewed passion, dedication and a commitment to honor and excellence. As I move forward with this life as a sailor, chef, writer, photographer, father and husband, this film that so eloquently captures the life and spirt of a true shokunin resonates. 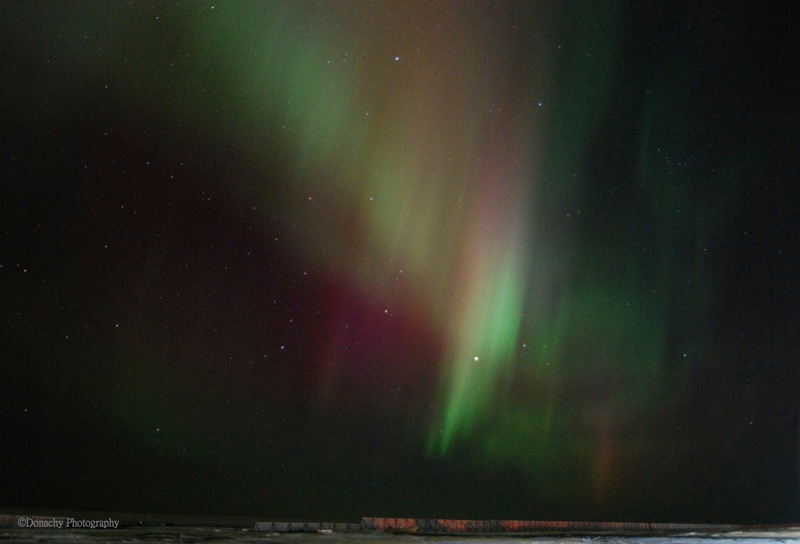 Named for the Roman Goddess of dawn, Aurora, and the Greek word for north wind, Boreas, Aurora Borealis events originate with the sun and are carried to Earth on solar winds. Notice the seal skin boats in front of the snow fence in this photo looking northwest along the lagoon at Point Hope. 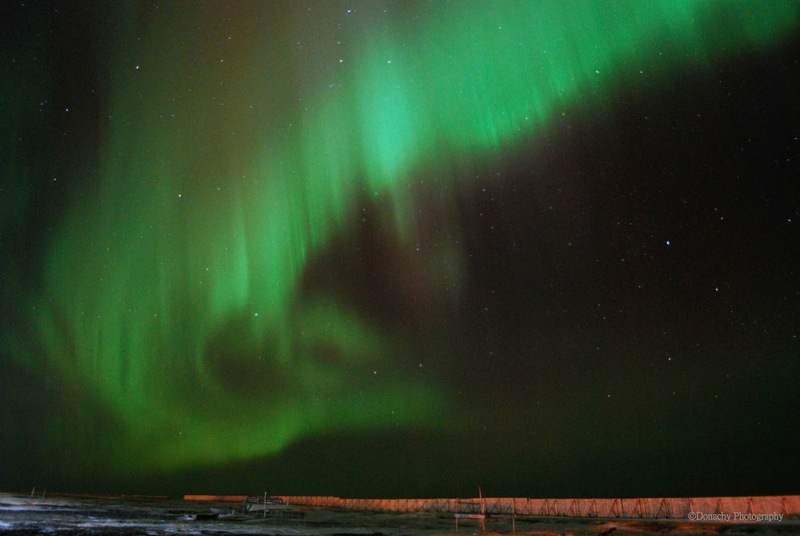 The most common color for Northern Lights is green – whitish green on nights of weak activity. Yellows, pinks, reds and purples are less common. 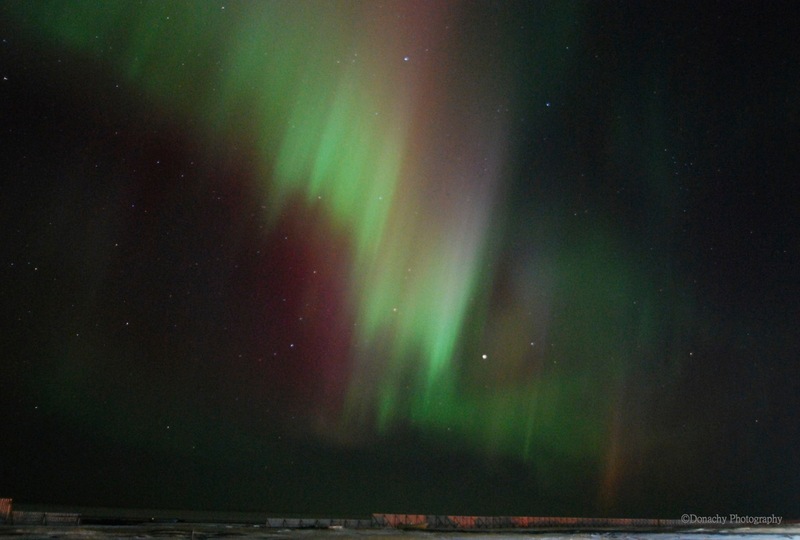 Any color in the night sky is a thrill. We have a phone tree set up so we can let each other know when the lights are out in force. When our phone woke us just after five AM this morning, we didn’t even pick up. We threw on warm clothes and coats (the windchill was below zero degrees Fahrenheit) put together the camera and tripod, and headed out the door. We walked away from the town’s lights, to the darkness near the lagoon, and set up. We took these shots with a 15 second exposure. When the lights are active, they move, constantly changing shape and color. Patrolling Hyder, Alaska’s Fish Creek like she owns it, 600-pound Monica fattens up on a freshly subdued chum salmon. With a population of fewer than 100 residents, Hyder, Alaska, bills itself as “The Friendliest Ghost Town in Alaska.” The town is one of those gems that is far enough off the beaten path to still be something of a secret, known mainly to the relatively few people who travel the Cassiar Highway in western British Columbia. Many of these travelers are on their way to or from Alaska, and not even all of these travelers are aware of what Hyder offers. 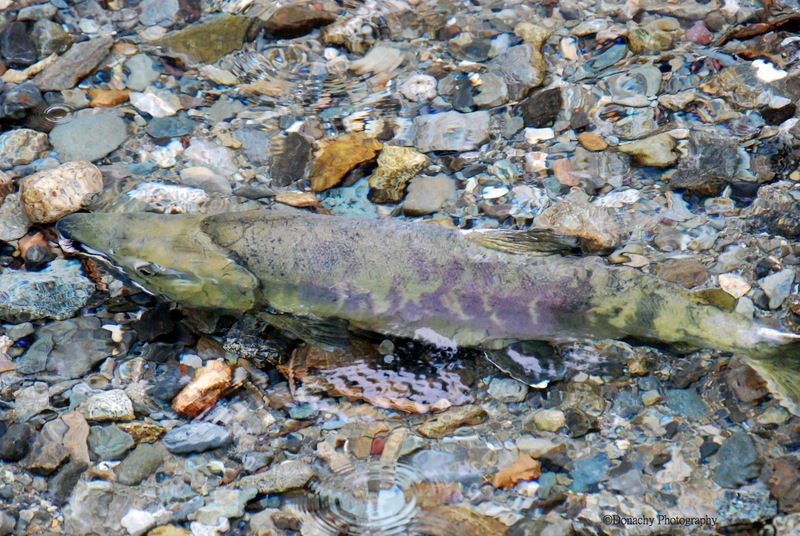 A prize for any grizzly, this beautifully marked chum salmon makes its way up the air-clear water of Fish Creek. In addition to rare opportunities to watch and photograph grizzlies up close from a safe vantage point (an elevated viewing deck runs along a short portion of Fish Creek), Hyder boasts what is surely one of the world’s most unusual destination restaurants. 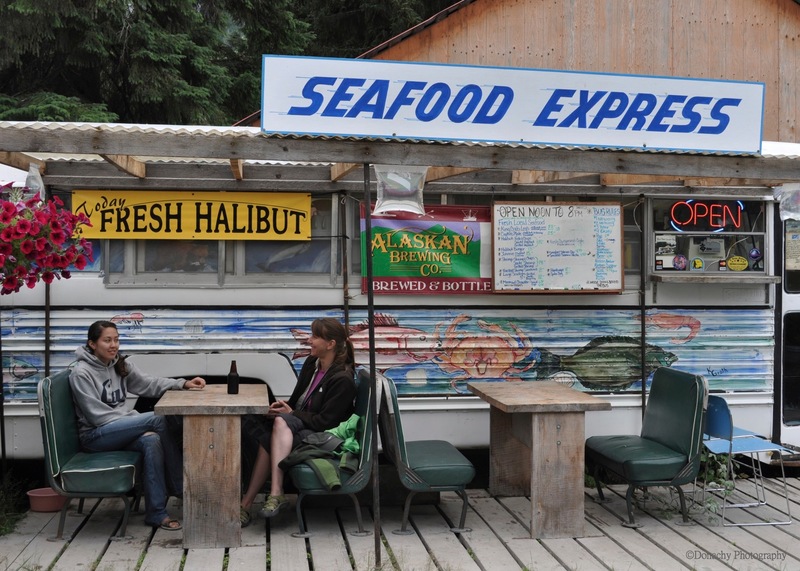 We’ve written about the Seafood Express in a previous post. Established in 1998, the school bus Jim and Diana Simpson converted into a restaurant continues to turn out the very best fish and chips we’ve ever had. Even when the salmon and bears aren’t in, the restaurant alone makes taking the turnoff to Hyder worthwhile. Jim, a fisherman by trade, supplies the fresh salmon, halibut, shrimp and prawns Diana magically transforms into perfectly crispy, golden-brown, airily light creations that seem to disappear in one’s mouth. Complimented by a bottle of Alaskan Amber Ale, lingering over a meal there is the perfect way to relax after a morning of nature watching while Rufous Hummingbirds trill musically from the nearby spruce and fir forest. 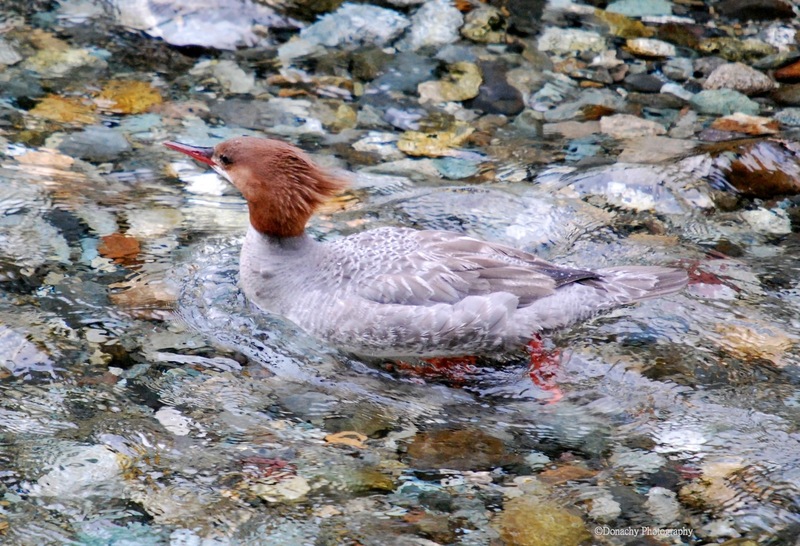 A female common merganser (Mergus merganser) leads her brood of chicks (next photo) down Fish Creek’s crystalline currents. 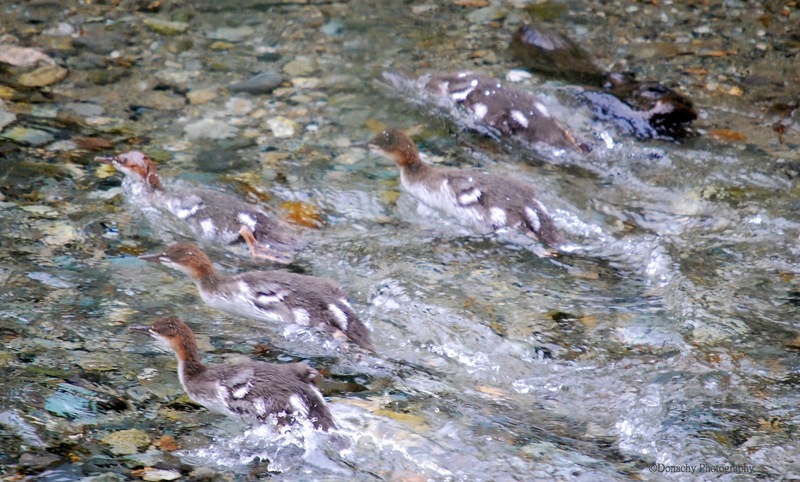 Merganser chicks scurry to keep up with their mother. This type of duck typically nests in tree cavities near water. They feed on small fish, insects and (I’m guessing) salmon eggs when they can find them. Since 1998, the Seafood Express has been serving up gourmet-quality fish and chips. 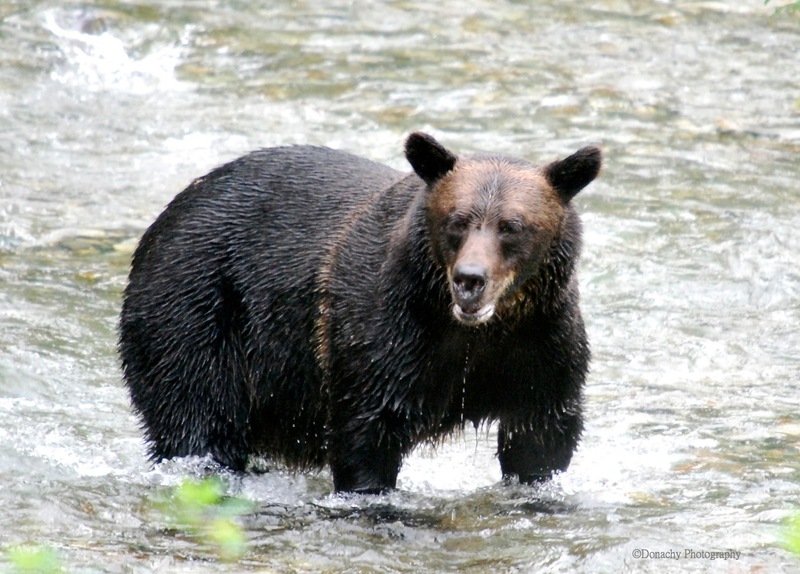 The viewing platform on Fish Creek provides one of the very few places in North America where people can routinely and safely view wild grizzlies from a fairly close distance. The platform is manned by knowledgable U. S. Forest Service Rangers. The best viewing is from late July through September. 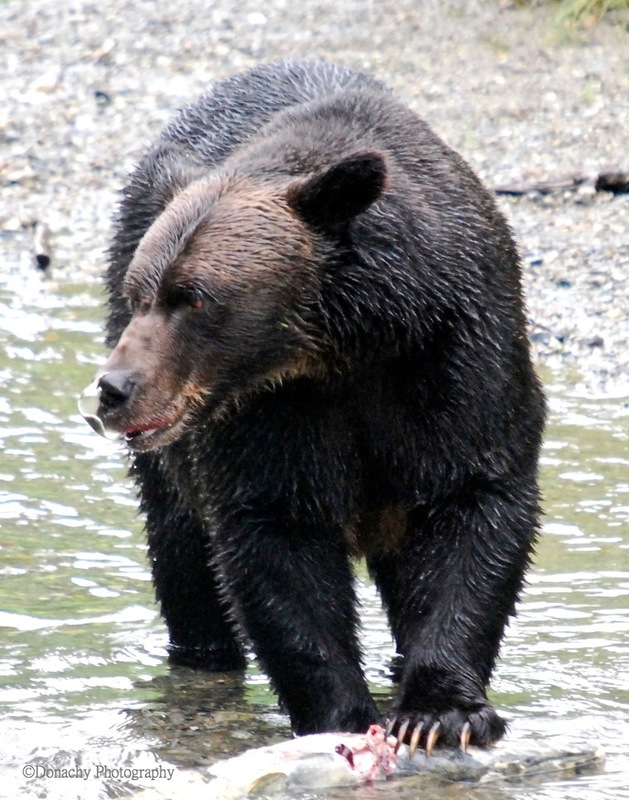 A trip to Alaska through British Columbia by car, camper or motorhome is a trip of a lifetime. If your route takes you along the Cassiar Highway, Hyder should be a “must visit” destination! For more, click here to see our iReport on CNN.